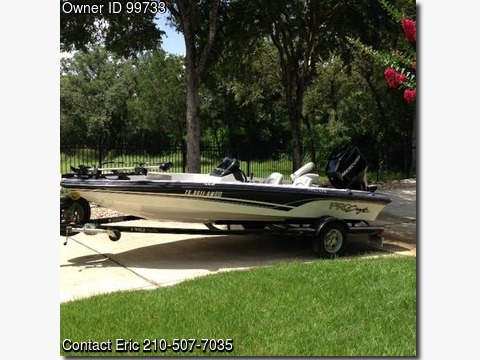 Please call owner Eric at 210-507-7035. Boat is in San Antonio, Texas. 2006 Tracker ProCraft 175 Bass Boat with Mercury 115 HP 4-Stroke EFI Outboard Motor and Trailstar Custom Trailer Package..We have all titles. The ProCraft 175 includes 2 New Interstate Batteries, Trolling Motor, Lowrance X37 TX Fish Finder, Bow/Aft/Port/Starboard Storage with Rod Organizer, Pro Seat with Pole Exchange, Aerated Livewell, Carpeted Deck, Insulated Cooler, Fire Extinguisher, and Navigation Lights. The boat was purchased new in 2007, has been stored in a garage since then, and used only in fresh water. . .it is in excellent condition. There are approximately 75 hours on the Mercury Outboard Motor. The Trailstar Custom Trailer includes two new, low mileage tires along with a spare, pivoting tongue jack, “EZ” lube hubs, and non-skid fender pads. Other accessories include Ropes, Bumper Guards, Anchors, Life Jackets, and Paddle.